MQ-501: Handheld Full-spectrum Quantum Meter - Apogee Instruments, Inc. The MQ-501 is designed to be an easy-to-use handheld meter for spot-check measurements. The meter includes the AM-001 meter mounting bracket to mount the sensor on a horizontal plane to the meter and approximately 0.17 m of cable to accommodate the bracket length. The full-spectrum sensor incorporates a blue-enhanced silicon photodiode and custom optical filters with a rugged, self-cleaning sensor housing design, anodized aluminum body with acrylic diffuser. Typical applications include PPFD measurement over plant canopies in outdoor environments, greenhouses, and growth chambers, and reflected or under-canopy (transmitted) PPFD measurements in the same environments. The meter has a sample and log mode, and will record an integrated daily total in mol m-2 d-1. Sample mode will record up to 99 manual measurements. Log mode will power the meter on/off to make a measurement every 30 seconds. Every 30 minutes the meter will average the sixty 30 second measurements and record the averaged value to memory. The meter can store up to 99 averages, once full it will start to overwrite the oldest measurement with new ones. An integrated daily total will be recorded from the 48 averaged measurements (making a 24 hr period). Sample and log measurements can be reviewed on the LCD display or by downloading the data to a computer, however, the integrated daily total can only be viewed by downloading the data to a computer. Downloading data to a computer requires the AC-100 communication cable (a standard USB cable will not work) and ApogeeAMS software. Comes with a free protective carrying case. How is the MQ-500 different from previous Apogee quantum sensors? 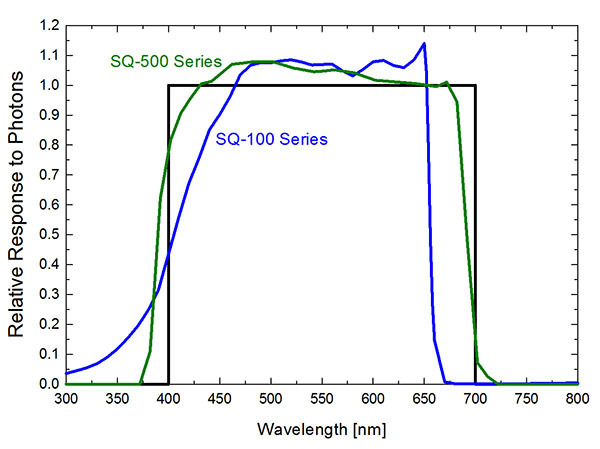 The MQ-500 is a full spectrum quantum sensor with a spectral range of 389 to 692 nm ± 5 nm, which can be seen in the graph below. This improved spectral respose increases the acuracy of LED measurements. Where is the MQ-500 used? The MQ-500 is used to measure incoming PPFD measurements in outdoor environments, greenhouses, and growth chambers.